No one symbol stands for Nova Scotia more than the Bluenose schooner. The ship’s image is seen on Nova Scotia license plates and on the Canadian 10¢ coin. You’ll also hear Nova Scotians called ‘bluenosers’ but that’s another story. The Bluenose was both a racing ship and a fishing vessel and, after her Lunenburg launch in 1921, she dominated the international racing scene for nearly 2 decades. After World War II, however, there was less need for fishing schooners and the Bluenose was sold off to work in the West Indies, where she was shipwrecked on a reef in 1946. Her legend lived on among Nova Scotians though and Bluenose II, an exact replica, was launched in 1963. Many of the men who worked on the original also built her daughter. 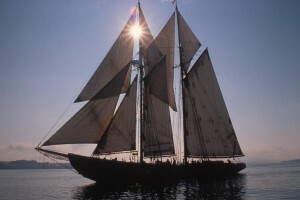 Bluenose II quickly became a major attraction and her owners, who had the ship built as a promotional tool for a brewery, sold her to the government. Today the Bluenose II receives visitors in Lunenburg during the winter. Summers are spent sailing to ports around the province like Halifax, Mahone Bay and Pictou. If you’re in the neighbourhood, it’s definitely worth taking one of the 2-hour cruises on the Bluenose II. They run from various ports between June and September but book a spot early because they sell out quickly. For more information on the Bluenose II, including sailing schedules, see the Bluenose II website.